how to edit a Vimeo video. SEE ALSO: Download Vimeo Videos Free with YouTube downloads tool. 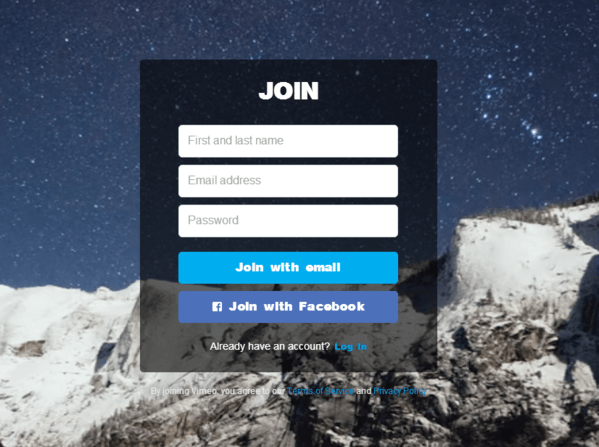 If you don’t have a Vimeo account, you can easily create it. There are two ways to do it: access with your Facebook account or create a stand-alone account on Vimeo. The latter requires proving your name, email and creating a password. If you decide to log in with Facebook, you’ll need to confirm your decision and install Vimeo Facebook app. As soon as you log in, Vimeo will offer you three account types to choose from: Basic, Plus, and Pro. Vimeo Basic is a free account with minimum features. Upload 500 MB per week or 25 GB of videos per year. No ads on your videos. However, you’ll see ads of other users’ videos. Videos are optimized only for desktop. You can create 1 group, 1 channel, and 3 albums. Protect videos with a password. Basic video conversion. It means that your video will get in a queue when you try to upload it. It’ll appear online in a couple of minutes. Basic support. The support team will answer your question within 3 business days. Basic stats. You’ll be able to see how many people have viewed and liked your video. As you can see, it’s a simple account that will be perfect for all those who just want to share a few videos with friends. Vimeo Plus is available for $59.95 per year or $9.95 per month. If you choose the second option, don’t forget to make payments on a regular basis otherwise your account will be set to Basic. 5 GB per week or 250 GB per year for your videos. No ads on your videos. No banner ads for you. Videos are optimized for mobile devices. Unlimited number of groups, channels and albums. Priority video conversion. Your videos will appear on the site faster than with Vimeo Basic. Advanced privacy which includes password protection and domain-level privacy. 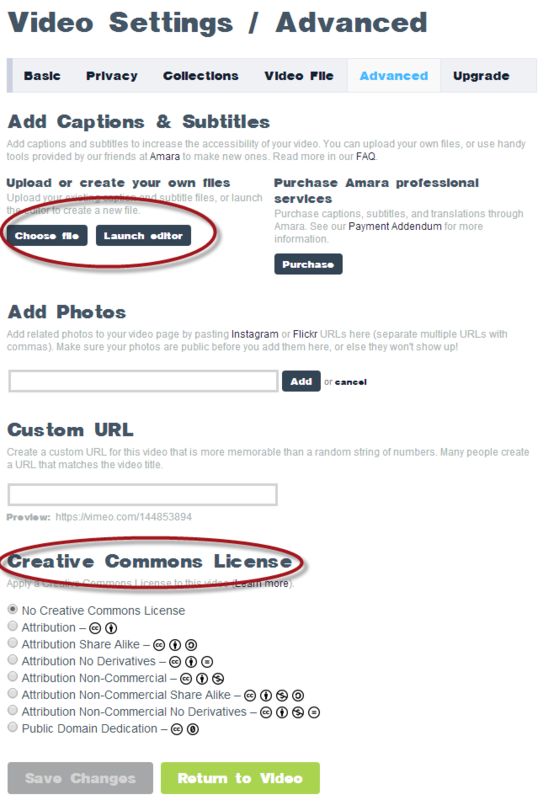 This option lets you choose domains on which users can embed your videos. Priority support. The support team member will answer your query within 4 hours on a business day and 24 hours on weekend. Advanced stats. Apart from the Basic stats, you’ll be able to see where your videos were embedded, overview stats for different time period and see other important data. Customized video player and outro. 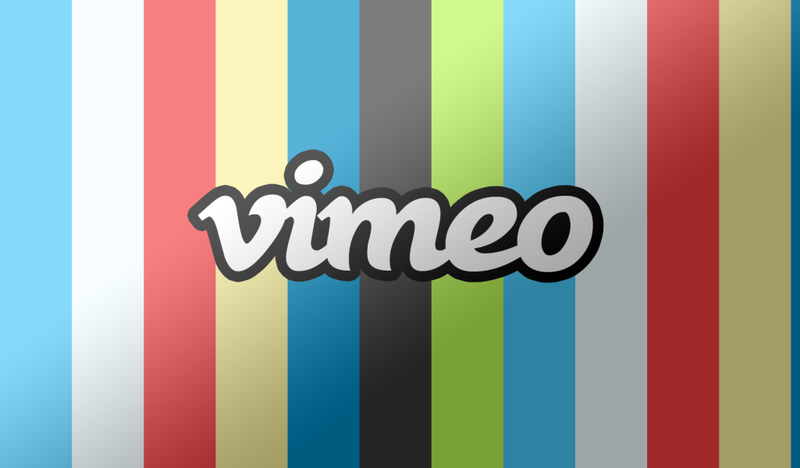 Vimeo Plus account will be great for average-level freelances and small independent web and video studios. 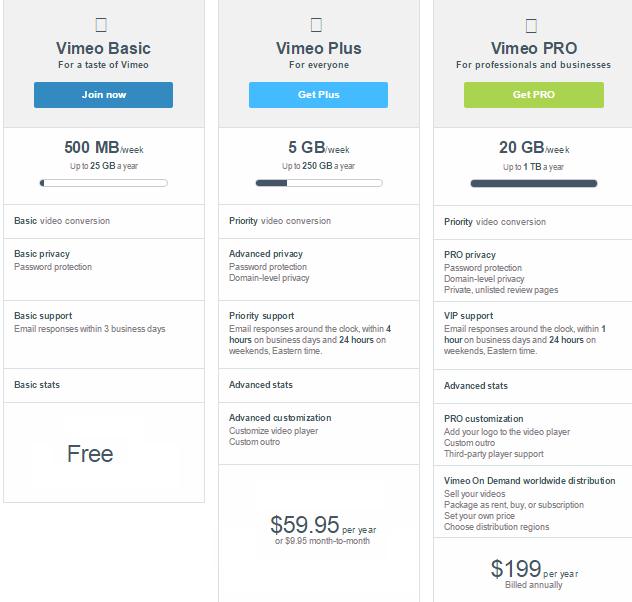 Vimeo Pro is a paid account with maximum options. It’ll cost you $199 per year for 1 TB or $399 per year for 3 TB of free space. No ads or banners for you and your viewers. Priority video conversion. Your videos will be moved to the top of conversion queue. 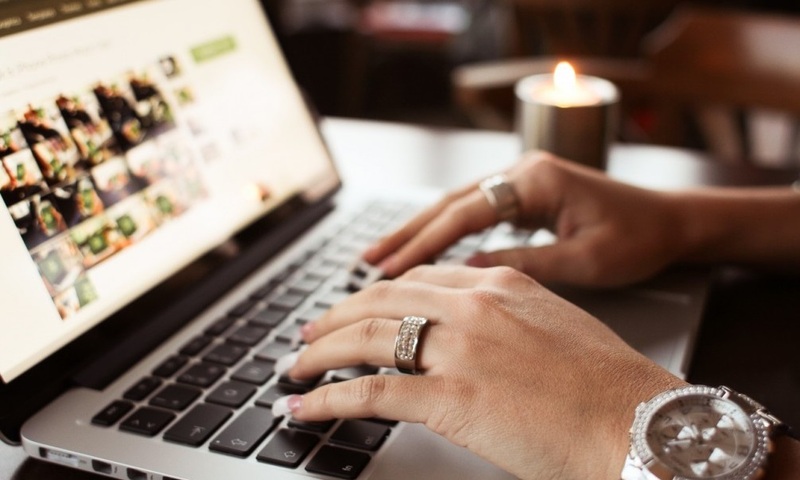 PRO privacy that lets you protect videos with a password, choose domain-level privacy and create private, unlisted pages for your videos. VIP support. You’ll receive an answer to your question within one hour on working days and within 24 hours on weekends. Video player customization. You can add your logo to the video player, and create custom outro. There is also third-party player support. Paid video distribution. With Pro account, you can sell or rent your videos, choose distribution regions and set the price for your masterpieces. 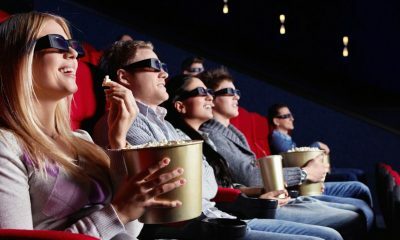 Your videos will be available in “Watch on demand” section where users can choose whether they want to buy them and watch 24/7 or rent for a couple of days. Vimeo Pro account is a must-have for businesses, professional video editors, musicians and all those who create high-quality video content and want to be paid for that. Now, when you chose your Vimeo membership, let’s upload your 1st video. The procedure is not difficult at all. Click the Upload a video grey button. Choose files to upload by clicking the corresponding button or simply drag-n-drop them. 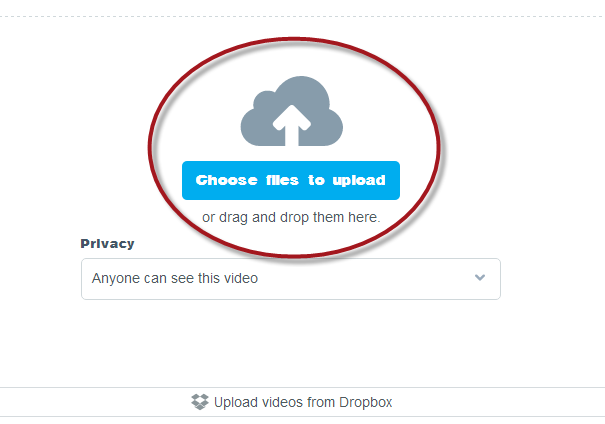 You can also choose to upload a video from your Dropbox account. Add video title, description, language, and tags. Don’t forget to set Сontent rating. Save your video to apply changes. In case you have doubts whether you can upload a video to Vimeo or concern about tech specs, please read Vimeo guidelines and FAQ for clarification. Basic Vimeo video editor is not that advanced as YouTube one, but you can also make some changes. As soon as processing sign disappears from your video, it means that your video is uploaded to Vimeo. Now you can make some edits. 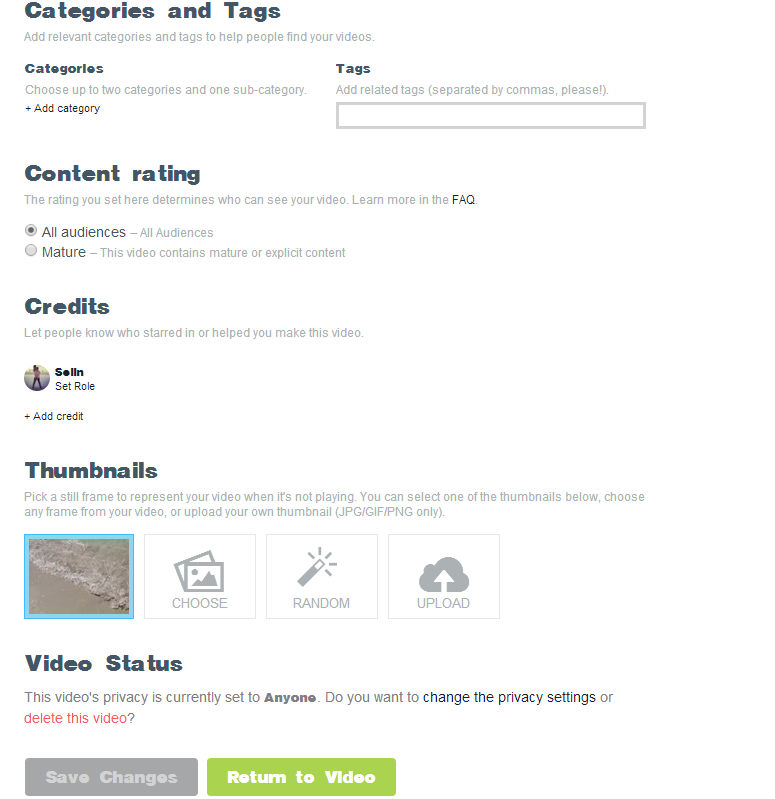 In this tab you can set a category for your video, add credits and choose a thumbnail. 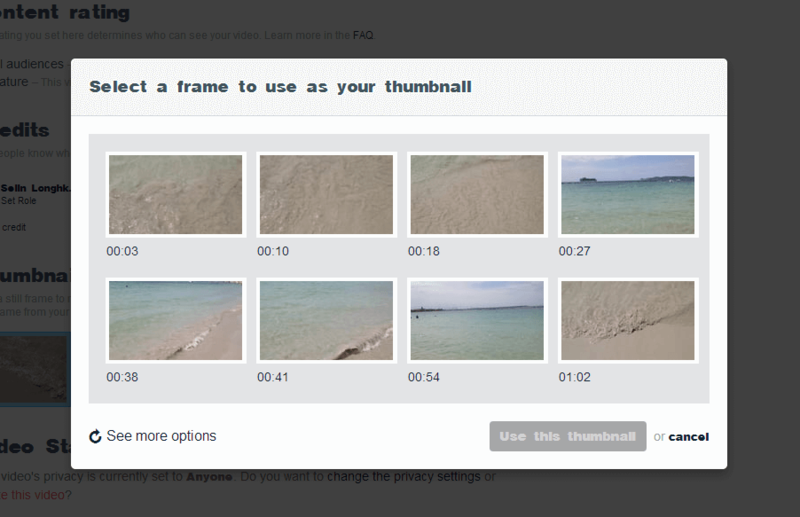 Vimeo lets you set a random thumbnail, choose a particular video screen or add a good image from your PC. Just click on a corresponding icon and select what you need. As we told you above, Basic Vimeo privacy settings are not numerous. Who can watch this video? You may grant access to all users, make the video available only to people with a password, make it visible only for you or a selected number of people. Where can this video be embedded? Choose whether people can or cannot embed your video. Who can comment on this video? Here you can open comments to everyone, no one, or selected people. What can people do with this video? There are two things to select: download the video (users will be able to save your video on their PCs) and add to their collections (users can save your video to their albums, groups or channels). This tab is pretty much simple. If you have a video album, group or collection, simply choose the one you want to add your video to. In case you don’t have a collection, click your Vimeo profile picture at the top right corner and choose Collection from dropdown menu. When a new page opens, choose what you want to create and click the corresponding button. Add captions and subtitles to make your video more accessible. You can either upload a ready subtitles file or transcribe your video in built-in editor. Add photos. Paste URL from Instagram or Flick with pics that reflect your video content. Don’t forget that images should be public! Create custom URL for your video. It’ll make your video look more personalized and professional. Add Creative Common License. Choose one of the options if necessary. That’s all! 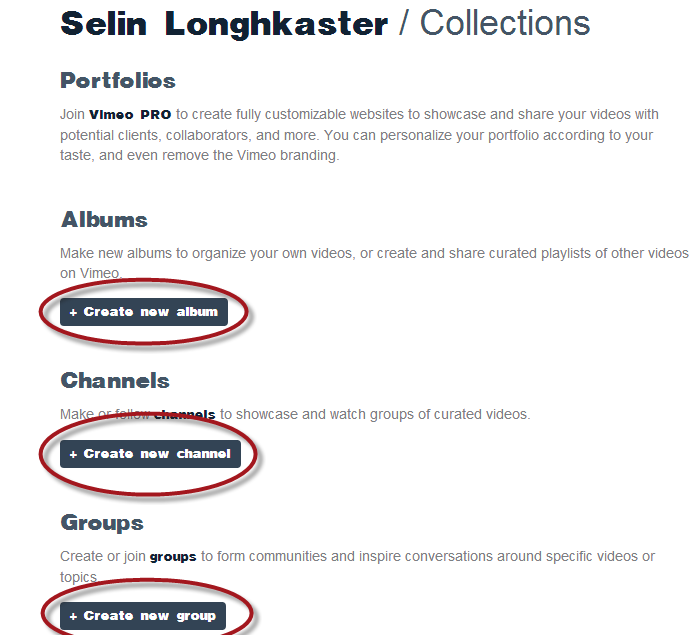 As you see, creating Vimeo account and adding a video into it is not difficult at all. Please share this post with your friends and make them also sign up to Vimeo to enjoy great HD channels and videos.